YouTown, the app that lets local governments put news, maps and information about city services in a mobile app, released its Android app. The iPhone app came out in May. More than 300 U.S. cities and counties have already signed up to use the YouTown platform, and the company recently expanded to include cities in the Netherlands and Canada. The company is planning an Australian launch soon, Sid Burgess, Director of Government Relations at YouTown parent company DotGov, inc. tells LAUNCH via email. "Every local government out there is trying to figure out how they can go mobile," Sid Burgess, director of government relations at DotGov, Inc. tells LAUNCH via email. "How they can reach citizens on the go." The Gov 2.0, or eGov sector, has changed and matured in the past few years to provide more citizen-focused solutions, Sid says. 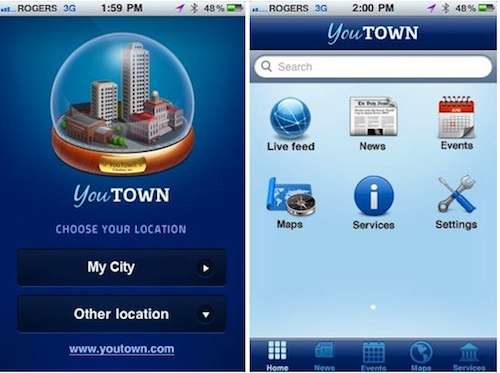 On the user side, the YouTown app will automatically display five nearby cities you can choose from. Once you have selected your city, the app will launch and give you the option to find information from news, maps events and services. Governments using the YouTown platform need to input the data for the app. YouTown suggests that they think about information in their FAQs or other services their citizens typically ask about. In Shawnee, OK, the YouTown app offers a service called "Municipal Court / Pay Your Citation," which lists courts hours, payment types it accepts -- it even provides a link to email City Hall. Users in Enid, OK, can pay their water utility bill. The app also includes a link to pay for their Internet service as well. "I am talking about fundamentally changing the way a citizen interacts with their government, for the better," Sid says. "Allowing you to get your dog permit on your phone. Not having to find out which agencies or even local government level would be in charge of installing a media room in the library -- your latest idea you want to share." YouTown is in a similar space as services like CitySourced, which allows people to identify and report graffiti, pot holes and other issues. SeeClickFix, another 311-type service, allows users to report other issues to their government. Seattle-based Dotgov, Inc was founded in 2009 by Michiel Riedijk, who previously founded an e-gov company in the Netherlands.